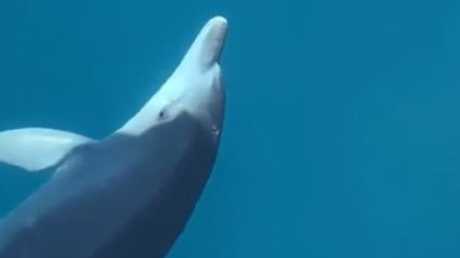 A DOLPHIN had dive boat crew flipping out after it visited them at a Great Barrier Reef floating pontoon. The bottlenose dolphin swam up to the pontoon at Moore Reef yesterday, much to the delight of Sunlover Reef Cruises' crew. Dive instructor Afu Hsu filmed the special marine visitor enjoying the calm waters at the front of the company's catamaran moored alongside the pontoon. Bottlenose dolphin visiting Sunlover Reef Cruises' pontoon at Moore Reef. At about 2.5m long, the crew recognised the dolphin as the same individual that has visited them in the past at the reef, as she occasionally has some scarring on her dorsal fin. While dolphins are common on the Great Barrier Reef, they are more usually spotted in the open ocean, rather than the shallow waters at coral reefs. The playful cetaceans love swimming ahead of slow-moving boats, often riding the pressure wave off the bow, allowing tourists to get a great view.